It’s good business, isn’t it? We’ve heard it a thousand——no, a million times, and we’re sick of it: the Wal-Mart model. The company that uses this model runs on the backs of hundreds or thousands of low-paid workers, lavishly rewarding executives and higher ed. administrators at the sharp point of the pyramid. Alongside the English ivy, diversionary wailing about the budget crunch creeps up the walls of our hallowed halls. (Of course, if the school cuts 90 percent of the adjuncts and gives those courses to full-time faculty, there may be a real budget issue—that’s another story.) Golly, there just isn’t enough money to go around. Why can’t adjuncts understand this simple concept? Because we received the email. It’s the email the admin forwarded (accidentally?) 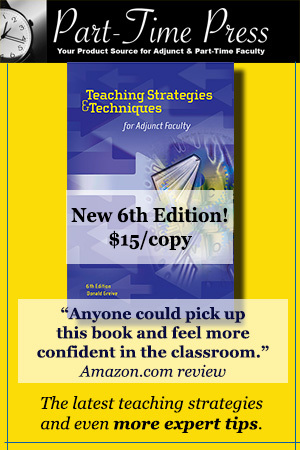 to ALL of the teachers—adjuncts and full-time faculty alike. It’s the email that described the college’s success in glowing terms along with the wonderful building projects, new degree programs, and general programs that were ahead. It described cost of living raises for full-time faculty, administrators, and custodians. It talked excitedly about new administrative positions that were coming to help the current army of administrators handle their finger-crushing workload. It may or may not have mentioned the IRS’s intention to establish health insurance requirements for adjuncts, and the school’s willingness to comply. But it didn’t mention adjunct pay. Not once. No soup for us—not even a spoonful. Then, she tears it in half. After several rounds of halving and tearing, and explaining what portions are for the building program, maintenance, admin and faculty salaries, she is left with a section the size of a postage stamp. She finishes her illustration by piling all of the other papers on top of the poor little postage stamp. Of course, this postage-sized piece of the budget goes to support what the college is all about: instruction—not greeting shoppers, hanging baby clothes, or stocking shelves with sports equipment. These instructors had to jump through a few more hoops than the average Wal-Mart worker (whom we certainly respect for her/his hard work in another field). Perhaps many of the adjuncts will not see the email because they are too busy teaching an outrageous number of classes at multiple schools. 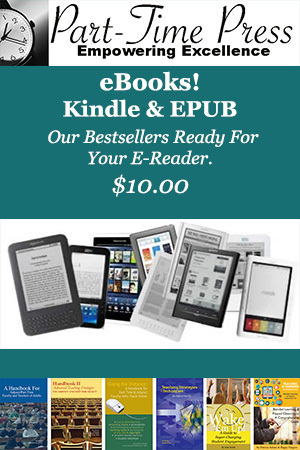 Others may see it and not read it; others may read all or part of it and become discouraged. In the end, perhaps a group the size of a postage stamp may critically read and intellectually process the email. Will they share it with other adjuncts? Legislators? News sources? Will anyone pay attention to a postage stamp in the age of email and canceled Saturday deliveries? They might if that stamp represents 80 percent of instructors—all of whom deserve a fair and equal portion of soup. Professor Procrastination—The Fine Art of Cleaning the Fridge While "Grading"
I agree with Dan that it is time to organize to become visible. 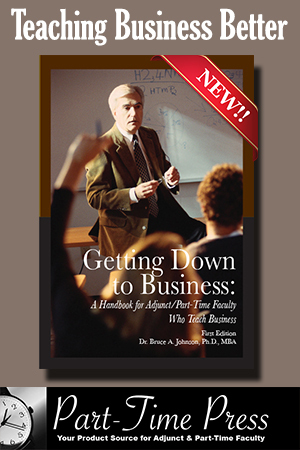 As adjuncts, we are doing 80% to 90% of the teaching at our colleges and universities. The students are people that we connect with at the college or university. My university is a private non-profit, so almost all the money comes from the tuition. I rarely have connect with other adjuncts, even in my own program. That seems strange how isolated we are. I loved this piece! Virtually the same thing happened where I teach. The Department Chair sent out an email about salary increases for the fulltime faculty to everyone, including the pters. Lots of fretting over how much the fulltimers could expect to see their salaries go up. Meanwhile there are pters in the department (myself included) who have been here for over a decade without an increase in our pay. While the Chair was embarrassed, there was little recognition of how outrageous it was that the people who teach the majority of the courses haven’t gotten pay raises in forever. Wow! Isn’t it amazing that we have to keep pointing out the problem? Administration doesn’t want to think about it because the situation makes them feel uncomfortable, but our discomfort increases when they are allowed to sink into the easy chair of forgetfulness. Brava. In the post, Sandra, you make so much more clear what it is that adjuncts want–and why they have a right to it. Wish Virginia were going to comply with ACA, though–soem systems might be, but VA is trying not to. Thank you. Yes, as you say, we have a right to more than this. As an English composition instructor, I often earn less less than minimum wage, and the school does not offer health insurance to adjuncts. In our adjunct meeting this afternoon, an administrative representative offered us “professional development” on campus (presumably more Excel and Word classes). We told him that we needed more money for the work we were already doing–not a few dollars for sitting through a class for a few hours. 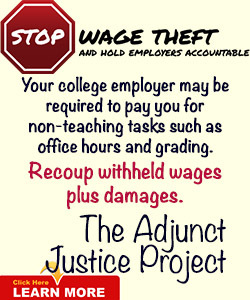 Why aren’t adjuncts better organized on a national level? as a place to start? @Dan, adjuncts are making impressive strikes in becoming better organized on the national level through a variety of organizations. If, on the other hand, you’re wondering why adjuncts don’t have their own national labor union, it’s because within the organizations that have been founded, the national labor unions, in several notable instances, have co-opted leadership of those organizations. It has been an effective method of pushing their own agendas, which have been woefully wanting in the efforts to stem the exploitative hiring of non-tenured faculty and bargaining for pay equity. but the schools are using it as an excuse. We’re worried about the same thing, Bill. In fact, our administration mentioned that cuts might be necessary because no health insurance companies were interested in covering part-time, contingent workers who might not work every semester. We suggested that the school provide us with contracts that span semesters, which they are legally allowed to do. We did not receive an answer to this suggestion.